Abstract: When the sector of intelligent self-balancing scooter thrived, the single-wheeled intelligent scooter predominated in the market for electric scooter, because of the small-size and light-weight. Lionel who is an office worker in a small company is one of the beneficiaries of Airwheel X8 single-wheeled electric scooter. When the sector of intelligent self-balancing scooter thrived, the single-wheeled intelligent scooter predominated in the market for electric scooter, because of the small-size and light-weight. Lionel who is an office worker in a small company is one of the beneficiaries of Airwheel X8 single-wheeled electric scooter. Because of the small scaled, his company has no dining room, so that the seven works have to walk long time to have lunch. As their company is located in an industrial park, they have to walk a long time to find a restaurant. The limited lunch break always makes them in a hurry. Adopting aerospace attitude control theory, fuzzy software algorithm and gyroscope system, Airwheel X8 electric hoverborad can maintain balance by leaning forward and backward. That is, Lionel can control X8 to go forward, accelerate, decelerate, and brake, etc. by leaning forward or backward. It saves time for people and thus they have more time to have a good rest after lunch, which is helpful for improving both work and study efficiency. Meanwhile, Airwheel X8 single-wheeled self-balancing electric scooter is powered by SONY lithium-ion battery, environmental-friendly and energy-efficient. With the increasingly polluted environment and global warming trend, it is urgently needed to choose the green energy, from the daily transport to every aspect of our daily life. 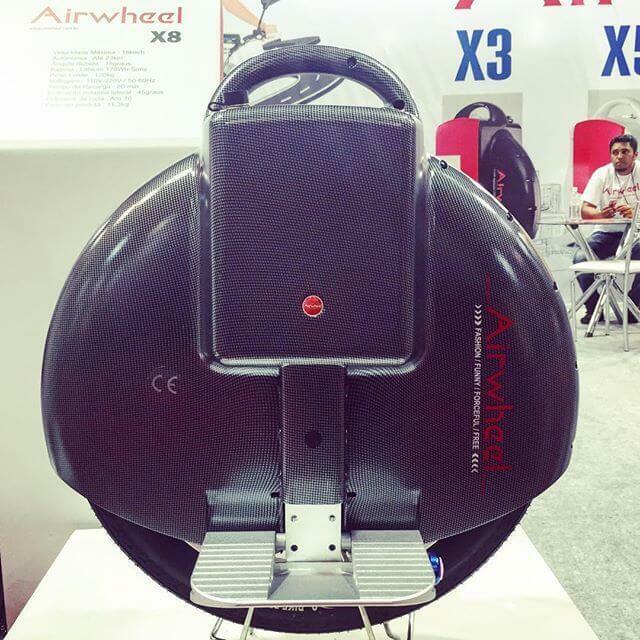 Also, Airwheel X8 one wheel scooter is known as the SUV self-balancing electric scooter with the 16 inch wheel and strong power that can be used in other aspects in life, such as exercising and entertainment tool. Airwheel X8 electric self-balancing scooter comes as a blessing to Lionel.